According to the economic survey 2017 demonetisation has long term benefits coupled with follow up tax actions. Hence, we provide Economic Survey 2017 questions on demonetisation for IAS Prelims 2017. The Economic Survey of India is an annual document of the Ministry of Finance, Government of India. According the survey via demonetisation government announced a historic measure, with profound implications for the economy. The two largest denomination notes, Rs 500 and Rs 1000, were “demonetized” with immediate effect, ceasing to be legal tender except for a few specified purposes. 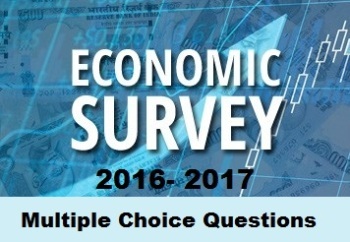 Here, we provide exclusive questions on demonetisation from the Economic Survey 2017 which can prove to be extremely helpful in IAS Prelims 2017 preparation. 1) Company pays employee salary in cash; payment and receipt are declared to tax authorities is white cash. 2) Household keeps savings in cash for emergencies are black cash. 3) Businessman hoards undeclared cash, with a view to distributing it to his candidate during elections is black cash. Function and nature are quite distinct. For example, cash used as a store of value could be white (the savings that all households keep for an emergency), while cash used for transactions could be black (if it was earned through tax evasion and/or corruption). Moreover, categories are fluid. Company pays employee salary in cash; payment and receipt are declared to tax authorities. Small enterprise pays for input in cash; neither declares the transaction to tax authorities. Household keeps savings in cash for emergencies. Businessman hoards undeclared cash, with a view to distributing it to his candidate during elections. Cash held as black money can be converted to white through laundering and other means, or by declaring it to the authorities and paying the associated tax/penalty. 2. India’s level is somewhat higher in the cash to GDP ratio against country per capita GDP than other countries in its income group. What does this indicate? a. All of the cash holdings were used for legitimate transactions in India as it has a high growth rate. b. Some of the cash holdings were not being used for legitimate transactions, but perhaps for other activities such as corruption. d. It does not specifically indicate anything about Indian growth rate. The cash to GDP ratio against country per capita GDP shows that on average the use of cash does indeed decline with development. India’s level is somewhat higher than other countries in its income group. This might seem to suggest that some of the cash holdings were not being used for legitimate transactions, but perhaps for other activities such as corruption. This presumption is especially strong because across the globe there is a link between cash and nefarious activities: the higher the amount of cash in circulation, the greater the amount of corruption, as measured by Transparency International. In this sense, attempts to reduce the cash in an economy could have important long-term benefits in terms of reducing levels of corruption. In India cash in circulation is relatively high for its level of corruption. This suggests two possibilities. Perhaps India’s level of corruption is much worse than the index shows so that the orange dot should really be placed to the right. Or cash is being used for other, presumably legitimate purposes. 1) Cash used as a store of value could be white while cash used for transactions could be black. 2) Cash earned through tax evasion and/or corruption is black cash. 3) Cash held as white money can be converted to black through laundering. Cash can be understood along two dimensions: its function and its nature/origins. In terms of function, cash can be used as a medium of exchange (for transactions) or as a store of value like other forms of wealth such as gold and real estate. In terms of nature, cash can be illicit or not. Function and nature are quite distinct. For example, cash used as a store of value could be white (the savings that all households keep for an emergency), while cash used for transactions could be black (if it was earned through tax evasion and/or corruption). Moreover, categories are fluid. Cash held as black money can be converted to white through laundering and other means, or by declaring it to the authorities and paying the associated tax/penalty. 1) India’s currency to GDP ratio appears to have responded to the growth of the economy. 2) India’s economy is relatively cash-dependent. 3) In India, cash in circulation is relatively low for its level of corruption. A few facts are relevant to and have motivated, demonetisation. First, India’s currency to GDP ratio has evolved in two broad phases. It declined fairly steadily for the first decade and a half after Independence, falling from around 12 percent in 1952-53 to about 9 percent in 1967-68. Thereafter, the ratio appears to have responded to the growth of the economy. The value of high denomination notes (INR500 and INR 1000) relative to GDP has also increased in line with rising living standards. Second, India’s economy is relatively cash-dependent, even taking account of the fact that it is a relatively poor country. The cash to GDP ratio against country per capita GDP shows that on average the use of cash does indeed decline with development. India’s level is somewhat higher than other countries in its income group. This might seem to suggest that some of the cash holdings were not being used for legitimate transactions, but perhaps for other activities such as corruption. In India, cash in circulation is relatively high for its level of corruption. This suggests two possibilities. Perhaps India’s level of corruption (or other related pathologies) is much worse than the index shows so that the orange dot should really be placed to the right. Or cash is being used for other, presumably legitimate purposes. 5. How high were India’s high denomination notes in terms of their use for transactions relative to the store of value? 1) In India, low denomination notes have a low soil rate. 2) The soil rate for the Rs 500 note and the Rs 1000 is high. In India’s case, the denomination/ income ratio has fallen sharply over the past quarter century because incomes have been growing rapidly relative to the prevailing highest denomination notes. This suggests that the high denomination notes have become increasingly useful for transactions over time. This impression is confirmed by cross-country data, which show that the Rs 1,000 note was in the middle of the pack compared to other currencies, especially those of its peer group of lower-middle-income economies. Perhaps the most conclusive evidence on the extent to which Rs 500 and Rs 1000 notes are used for transactions comes from data on “soil rates,” that is the rate at which notes are considered to be too damaged to use and have been returned to the central bank. RBI data show that in India low denomination notes have a soil rate of 33 percent per year. In contrast, the soil rate for the Rs 500 note is 22 percent and the Rs 1000 just 11 percent.